A report of shots fired Friday afternoon left a man dead in the Kirwan Terrace Housing Community, the V.I. Police Department reported. The victim’s identify was withheld by police pending notification of next of kin. 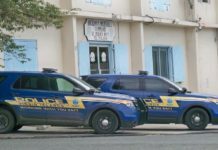 It was the eight homicide in the territory since the beginning of the year, the first on St. Thomas. According to police, at about 5:38 p.m. Friday several citizens called 911 and reported shots fired in the Kirwan Terrace Housing Community. Units from the Special Operations Bureau, the Criminal Investigation Bureau and the Richard N. Callwood Command traveled to Kirwan Terrace where an unresponsive male was located. The victim had sustained what appeared to be multiple gunshot wounds about his body. Emergency mMedical technicians were on scene and concluded that the victim did not have any vital signs. Police urged anyone with information on the shooting to call the Criminal Investigations Bureau at 340 774 2211, the 911 call center or the anonymous tip service, Crime Stoppers USVI, at 1-800-222-8477.